I served the 1897 Brownie as dessert following a Chicago-style pizza (look for a post on this Midwestern classic soon), as I knew it would be a better end to a rich meal than my usual brownie recipes. However, the first time I made the brownies, I followed the instructions a bit too closely. The recipe called for 35 minutes at 350 degrees. I thought I would be safe in checking the pan after 25 minutes of baking; they already were a bit too dry, a symptom of over-baking. I did not want to give up on the recipe and tried again, checking after 19 minutes – they were perfect in texture. The second time I added a 21st century twist: a bit of fleur de sel on top, which is completely optional and not traditional but contrasts the chocolate very well. My other adaptations to the recipe are decreasing the baking time, of course, and simplifying the directions a bit to make it easier and a one-bowl brownie. The brownie falls between the chewy and cakey categories (definitely not fudgey, which is hardly surprising given the absence of butter). It has a true chocolate essence but not an overpowering one. The texture is lighter than most brownies I have sampled, which the crunchy the walnuts complement. 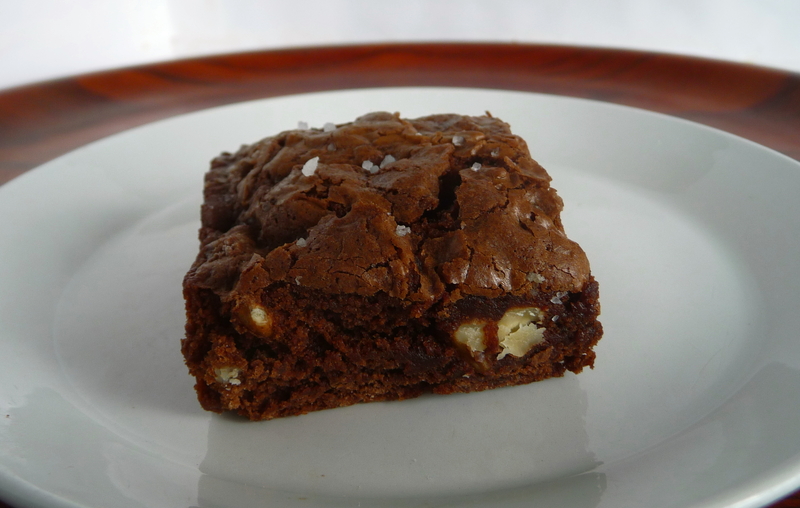 However, if you are curious about the brownie’s origin, this utterly simple recipe is worth trying. 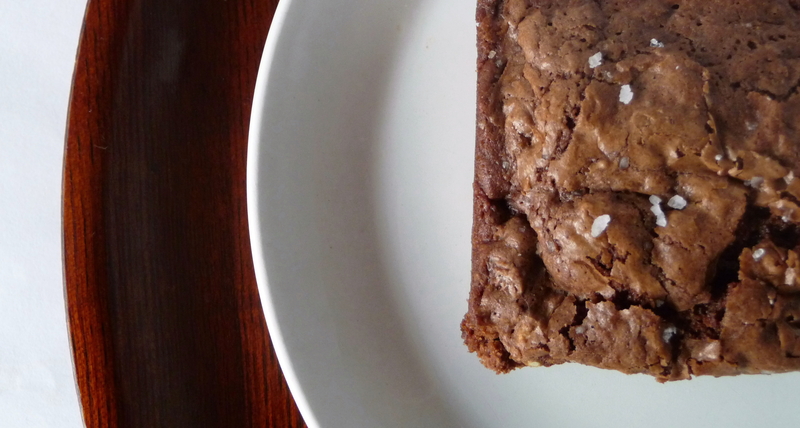 Bake the original 1897 Brownie, and maybe you, too, will add it to your brownie repertoire. At least you will have celebrated the origins of this most important of dessert categories. 1897 Brownies, adapted from Food: True Stories of Life on the Road, edited by Richard Sterling (which reprinted the recipe from The Food Chronology: A Food Lover’s Compendium of Events and Anecdotes, from Pre-History to the Present, by James Trager). Grease 8″ x 8″ baking pan (preferably non-stick) with butter or spray with cooking spray. Melt chocolate (or, alternatively, melt butter and whisk in cocoa), by the double-boiler method or in a medium-sized bowl in a microwave at 50% power, checking after 1 minute bursts, until almost entirely melted – stir to melt the remaining few bits. Add sugar and eggs. Combine thoroughly. Sprinkle baking powder and salt over bowl, stirring until well distributed. Add flour and walnuts, until just combined. Place batter into greased baking pan, smoothing evenly to the edges. Sprinkle the top evenly with fleur de sel, if using. Bake for 18-20 minutes, or until a cake tester, toothpick, or thin knife comes out clean; do not over-bake. The top crust should be shiny and cocoa-coloured (once it looses its sheen, it is over-baked). Cool on wire rack and cut into 16 2 x 2″ squares. Enjoy while reflecting on the brownie’s humble beginnings, way back two centuries ago. This entry was posted in Baking, Brownies, Dessert and tagged Baking, Brownies, Chocolate, Dessert, fast, Vintage Recipes. Bookmark the permalink. I love this recipe! I’ve been so busy, that I’m way behind in blogging several recipes. One of them is a recipe I made about two weeks ago, in my new brownie pan (coming, I promise). I love that there isn’t any butter in this! Perfect timing for the New Year brings people wanting to lose weight. Thanks, Deb. I wasn’t even thinking about the brownie’s low-fat quality at first, but I realize that it’s a fine recipe for that reason and others. Fantastic story of today, an international delicacy, which I adore it! Hi, Gera. I appreciate your sweet comments, coming from a guy who likes sweets so much! Your brownies stacked on parchment made for a gorgeous photo. I am now officially in the mood for brownies! These look yummy. Thanks, Geni, for your compliment. 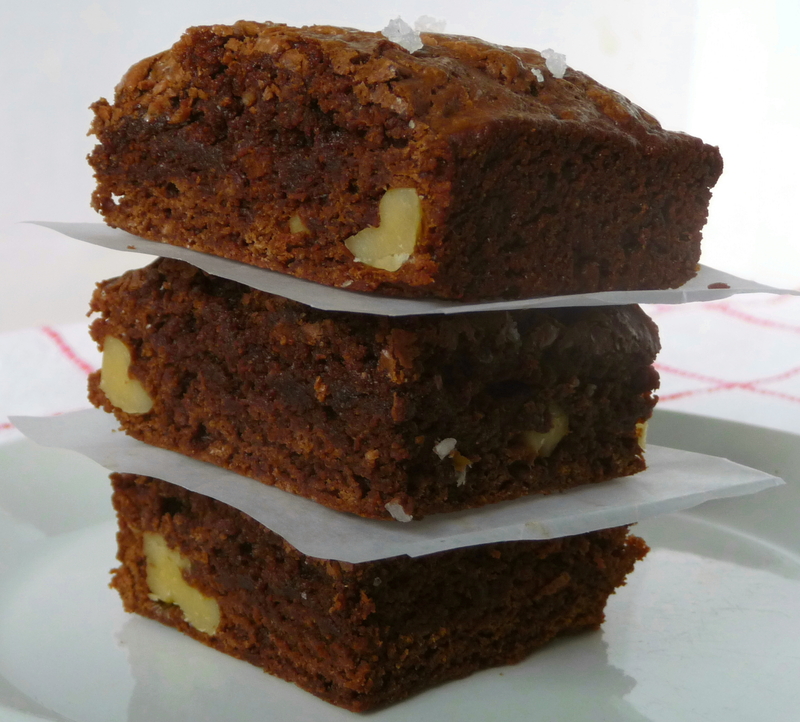 You should always go with your brownie craving – especially with a “lite” recipe such as this one – no muss, no fuss, no guilt! Thanks, Theresa. I feel the same about your site, too – always something to learn! In fact, I might have to overcome my 25+ years avoiding gin with your blueberry-infused version. I remember reading this post but not commenting. I’m not sure how I would do that, but apparently I did. You may have noticed I’ve been on a brownie kick, lately. I find brownies are a great thing to give away to friends, especially because being the anti-chocolate girl that I am, it’s a good way to use up the leftovers! And hey, they love chocolate! Am loving the fleur de sel on the top too – bet that adds a nice component! Hi, Jax. I noticed, I noticed! Maybe you’re learning to embrace your inner chocoholic? It’s an important part of your development, I’d say! Rather. So, a covert brownie shop? Were the brownies involved in black ops, do you suppose? Funny thing, I inherited all my dad’s cookbooks (that’s not really funny) but I now have this fantastic Laura Secord Canadian cookbook and it has the weirdest brownies. They’re delicious but not really fit for looking at because they’re so ugly. The recipe is completely expected as far as the batter goes then it adds this chocolatey syrup which prohibits the whole pan from setting properly so you have to eat it with a spoon. Deliciously uncivilized. Thanks, Joy. The American-in-Glasgow story was about how she baked brownies in a tiny kitchen then sold them all over the city illegally to restaurants and cafes (a brownie-black market?). What Laura Secord (with or without her cow) has in her cookbook sounds suspiciously like a hot fudge-brownie pie – it’s a self-saucing dish. This was very popular in the 1970s, too. Sinful desserts before the disco? I know this was posted a while ago, but I must present a correction. The Sears brownie recipe was not the first one published. The Boston Cooking School Cook Book of 1896 has a brownie recipe. This recipe contains butter, powdered sugar, molasses, egg, bread flour, and pecans. 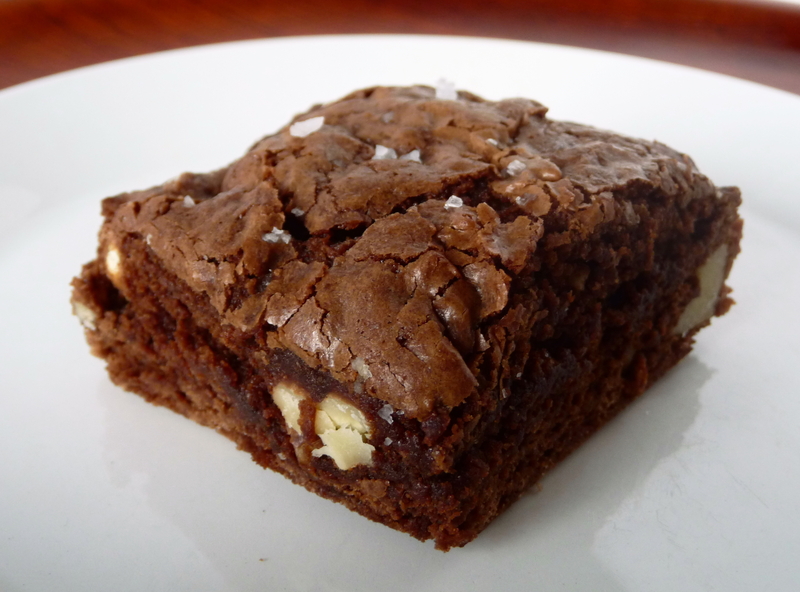 It is a possibility that the Sears recipe was the first brownie to use chocolate, but it was not the “earliest published” brownie recipe. exactly how much is 2 squares of chocolate? Made these brownies tonight. Yum-yum! I did bake them for the longer period of time. 19 minutes was not long enough. Do not have a printer and wish their was a way to Pin on Pinterest… Have you ever thought about having a pinterest site with your recipes? I am not on twitter or any other sites and you have no recipe box to file your recipes in.. I love this recipe,just wish I could pin to my board..
Did you make thiis website yourself or did you hire someone too do it for you? I did double it and turned out great. Thanks for posting it.